Digital transformation now dominates many C-suite and boardroom agendas. According to study, worldwide spending on digital transformation is expected to reach $1.7 trillion by 2019. However, in order to put digital transformation to work, it is imperative for organizations to transact business digitally anytime, anywhere, on any device, and in a manner that is secure. Enters DocuSign, a digital signature platform that enables you to prepare, send, manage and sign any document anytime, anywhere. 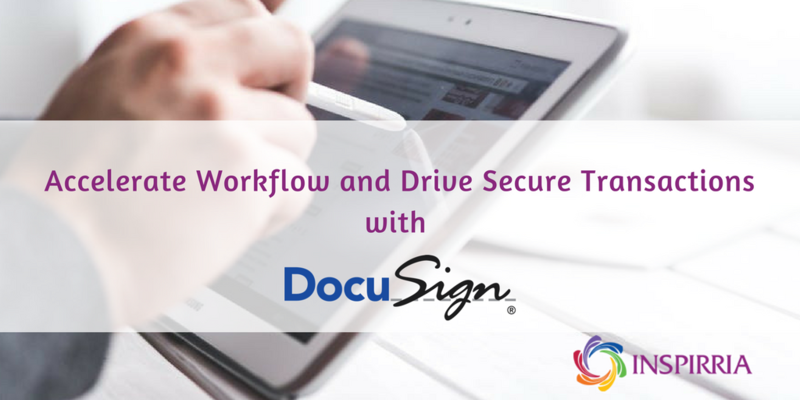 DocuSign provides a great way for enterprises to make their business processes more secure and compliant. In addition, DocuSign enables enterprises to securely store documents and access them anywhere, anytime. DocuSign empowers businesses to get work done faster by securely sending, signing and managing business-critical transactions from anywhere and on any device. It simplifies, secures and fully digitizes workflow and approvals, dramatically enhancing employee productivity. DocuSign helped an international sports organization minimize hassles of paperwork, such as health forms required during an international event, by deploying an e-Signature and digital transaction management solution. The result: improved operations and more time for sports activities. A leading motor manufacturing company leveraged DocuSign to streamline contract execution with a single transaction, instead of piecemeal agreements with various sales divisions involved in the transaction. This helped the automotive manufacturer enhance customer experience. DocuSign is not only easy to implement but helps users work faster and better with easy to access documents. Take the case of a private bank in Switzerland. The bank leveraged DocuSign to manage account documents and create a seamless customer experience with digital signatures, thereby delivering real value to customers. E-signature enhances the security of documents and improves authenticity of digital documents such as contracts, claims, policies, records and financial documents. For instance, a private bank in Switzerland ensured security of its digital certificates by opting for a hybrid solution from DocuSign. In today’s global environment, many internal processes require multiple forms to be completed, signed, routed, and archived. Digitizing these processes with DocuSign can help significantly reduce processing time and costs. This not only helps companies enhance user friendliness but also increase user productivity, reduce costs, and speed up time to revenue. Inspirria is a leading DocuSign partner offering seamless digital transaction services, including electronic signatures, payments, mobile and integration. We leverage strong encryption technologies and best-in class industry practices to help companies enhance customer experience and improve profits.